Hanukkah is one of my favourite holidays to celebrate and for those of you who don’t know what meaning of Hanukkah is, I’m going to share it with you now. The Festival of Lights, is an eight-day Jewish Holiday This year Hanukkah 2018 starts on Sunday, December 2 and ends on Monday December 10. At the heart of the festival is the nightly ritual of menorah lighting. The menorah holds nine flames, one of which is the shamash or “attendant”. The shamash is a very important because it is used to kindle the other eight lights. The festival of Hanukkah is observed in Jewish homes by the kindling of lights on each night of the holiday – one on the first night, two on the second, and so on until there are eight complete nights. I absolutely LOVE the eighth night because it feels so festive when the menorah is fully lit. Hanukkah is also when people traditionally receive and give gifts. That’s my favourite part of this celebration not to mention all the yummy food we traditionally serve such as latkes and jelly donuts. This year, I decided to take my mantlepiece to the next level by decorating it with a Hanukkah inspired theme. I think I’m getting pretty good at “mantlescaping” lately and it’s so much fun to change it up with each season. I scooped up all these beautiful decor items at HomeSense Canada (HomeGoods in the USA)and focused on incorporating different shades of blue in the “scape”. To complete the look I decided to tackle a quick DIY project. I made my own menorah! I used some simple materials to make my own candles and look what transpired. 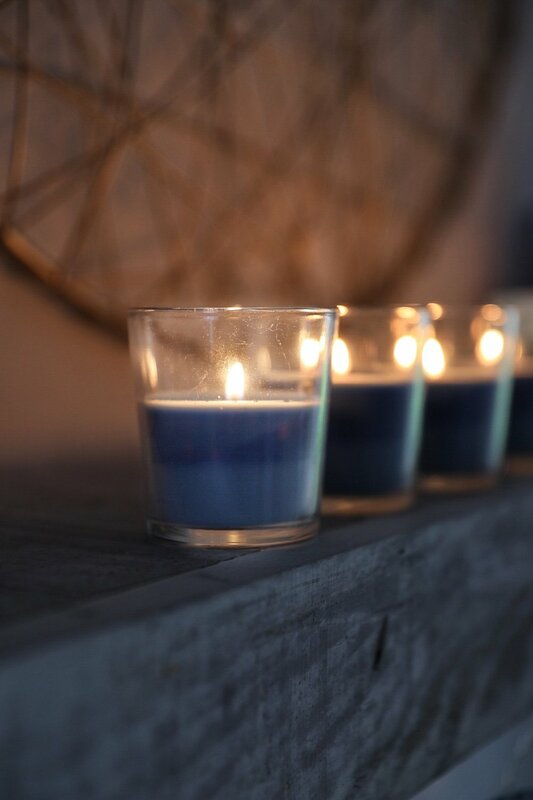 Cut the wicks to the same height of your votive, glass or jar. Make a bend on the candle wick about 1/3″ inch from the end of the wick. Using a hot glue gun, glue the wick to the bottom of the votive, glass or jar in the middle. Some wicks already have a metal middle ring at the bottom that you can use to glue to the jar, but if your wick does not have that, then use the bend method. Melt shortening in a glass jar in the microwave in 30 second increments. Use as much shortening as you’ll need for your votives, glasses or jars. How much shortening you use depends on your jar size. You’ll want the solid (unmelted) form to reach at least three quarters of the way up to the rim. Break off the tip of a crayon and crush it into small pieces. I used different colours of crayons to get a layered effect. Once the shortening is completely melted and hot, mix the smashed crayon tip into the melted shortening. You can add more smashed crayon for a deeper or different colour saturations. Pour mixture into prepared glass jar with wick. To balance the wick, I wrapped it loosely around a metal straw. Allow to cool completely or until hardened. Set the eight small votives, glasses or jars in a line and use the larger votive, glass or jar in the centre. *Note* I made the larger one by pouring the wax into a heat proof disposable coffee cup and let it cool completely. Then carefully removed the cup from the hardened wax.